(CNN) -- Despite its various setbacks, public bike-sharing is slowly but surely paving the way to a greener urban environment, one city at a time. Vienna's Citybike bicycles are easily recognizable in bright yellow and blue. The concept of community bike-sharing involves an individual checking out a bicycle from one of several public locations (such as a docked station) and returning it at another location. The principle is to provide an alternative or complementary form of public transport to cover short journeys within city limits. Think reduced carbon-dioxide pollution, smoother traffic flow and a healthier commute. After all, 94 percent of Parisian bike-sharers can't be wrong. This is the overwhelming proportion of users who declared themselves satisfied with the world's most high-profile bike-sharing system in Paris, France, according to a survey done about nine months after its official launch on July 15, 2007. While public-bicycle systems have been popping up progressively around western Europe over the past decade, it was Paris' Vélib' that inspired a more global trend. "Paris showed the world that a substantial bike-sharing fleet can change how people, non-cyclists, in fact, move about a city," says Paul DeMaio, founder of MetroBike consulting and the man behind the comprehensive Bike-sharing Blog. For instance, Vélib' offers a total of 20,600 bicycles (one per 100 individuals) at 1,451 stations throughout the city (every 300 meters), making the service both adequate and ubiquitous. To encourage a high turnover, the first half-hour of cycling is free, with users being charged in increments beginning at 1 euro for every half-hour thereafter. According to the survey, the average time for a single journey is 18 minutes. Vélib' belongs to the currently most common group of "third-generation" systems, in which "smart" bikes are equipped with electronic locking systems verified by credit card, theoretically allowing for better tracking and reduced risk of theft. Since its launch, Vélib' claims to have registered some 42 million users, from one-time clients to long-term subscribers, with each bike traveling an average of 10,000 kilometers a year. However, the double-edged sword of Vélib's success means that its inevitable flaws have been equally publicized. Shortcomings include reckless vandalism, theft, unsafe cycling, rude road behavior, and even the deaths of at least three Vélib' cyclists in traffic. Most of the damage is shouldered by JCDecaux, the advertising company responsible for keeping the system up and running in exchange for a 10-year license to exploit 1,600 citywide outdoor displays. Meanwhile, the City of Paris keeps the revenue from Vélib user fees. This initial agreement has resulted in ongoing disputes over who should assume financial responsibility for the vandalism and theft of abused bicycles. DeMaio calls this conflict of interests, characteristic of the advertising model of bike-share funding, a "moral hazard." "The advertising company does not benefit from revenues generated by the system as the jurisdiction does, so the advertising company does not have the same incentive to keep the bikes maintained as the jurisdiction would if it were operating the system," he reasons. "In fact, the better the advertising company has the bikes maintained, the more expensive it would be, and the less profit they would keep from the advertising contract." JCDecaux, which also powers bike-sharing systems in Luxembourg, Brussels, Vienna, Sevilla, Lyon, Marseille and several other cities, is not the only advertising company to grapple financially with municipal administration. In March 2009, the Spanish multinational Cemusa reportedly came very close to shutting down Rome's fledgling 9-month-old Roma'n'Bike after failing to secure a formal contract with the city. Clear Channel Outdoor, the advertising giant behind the SmartBike programs in cities such as Rennes (since 1998), Oslo, Stockholm, Milan and Barcelona (with 6,000 bikes reserved for residents only) has been relatively successful, building up from a smaller scale. As testimony to Barcelona's municipal participation to its resident "Bicing" system, the city developed an iPhone application specifically designed to help customers find the nearest available bike, launched in March 2009. The company also makes full use of advertising space on the bicycles themselves -- in some cities, even on the mudguards and provided helmets. Clear Channel Outdoor is also the first outdoor-advertising sponsor to break into the U.S. bike-sharing market with its SmartBike DC program, which has been operating up to 120 bicycles in Washington D.C. since 2008. After the city spent the past seven years installing 48 kilometers of bike lanes, the company chose to charge users an annual fee of $40 for unlimited use of bikes, up to three hours per journey. "The advertising-company model can be improved," says DeMaio, "but I think long-term sustainability would lend itself to the government, quasi-governmental transport provider, university, non-profit, and for-profit models." Urban transport providers in particular have been actively implementing bike-sharing programs in close cooperation with municipal governments, often featuring high-tech systems. Furthermore, most systems are now directly linked to Web sites that update the availability of bikes, and often their location, in real-time. Rio de Janeiro's Samba bike-sharing system, operated by the Brazilian parking company Mobilicidade, can only be activated by mobile phone, once the customer has registered online. Furthermore, Samba's stations are located exclusively along the city's popular beach promenade of Copacabana, where the system is supported by dedicated bike lanes, as well as the closure of the entire road to motor traffic every Sunday. 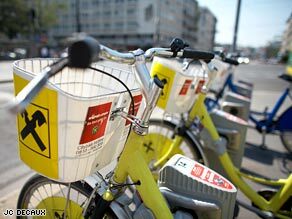 Other systems which rely on mobile-phone activation are Deutsche Bahn's Call a Bike and Nextbike, implemented in German cities such as Berlin, Frankfurt, Cologne, Munich, Stuttgart and Karlsruhe. While commuters and tourists alike are encouraged to hop on a bike as soon as they get off the train, Nextbike's advantage is that customers need only call the hotline number to locate the bicycle nearest to them, and then call again when they return it by locking and leaving it anywhere (i.e. not necessarily at a fixed station). Montreal's award-winning Bixi system, run by the parking company Stationnement de Montreal and famously designed by Michel Dallaire, has been highly touted for its sleek solar-powered docks equipped with RFID (radio-frequency identification) chip readers for wireless (and thus portable) connection and operation. Set to launch in May 2009 with 3,000 bikes at 300 mobile stations, Bixi calls itself a "fourth-generation" system, but for now it is more certainly one to watch. The Italian bike-sharing company Bicinittà has not only installed solar-powered shelters in cities such as Parma, in April 2009 it inaugurated pedal-assist bicycles in Genoa that help cyclists pedal themselves uphill -- almost one year after its pioneer pedal-assisted program launched in Monaco in February 2008. While the bike-sharing concept is no doubt promising in terms of sustainability, DeMaio believes that the biggest obstacles to its success are infrastructure, funding, and liability. "A jurisdiction must [already] have a network of bike infrastructure, such as bike lanes and cycle tracks (i.e. bike lanes physically separated from motor vehicle traffic) so that people have safe places to ride," he begins. "Funding is the next obstacle, as the capital cost of system implementation is about $3,600 per bike, which includes the stations and back-end system, plus another roughly $3,000 per bike annually for ongoing maintenance and distribution costs -- still cheaper than creating a streetcar line or subway station. "Liability is the third major obstacle, especially in more litigious societies such as the U.S., as insurers are hesitant to insure programs." But just as obstacles can be overcome in time, perhaps it will be the popularity of cycling culture itself that contributes most significantly to reducing motor-vehicle traffic and pollution in the long run.